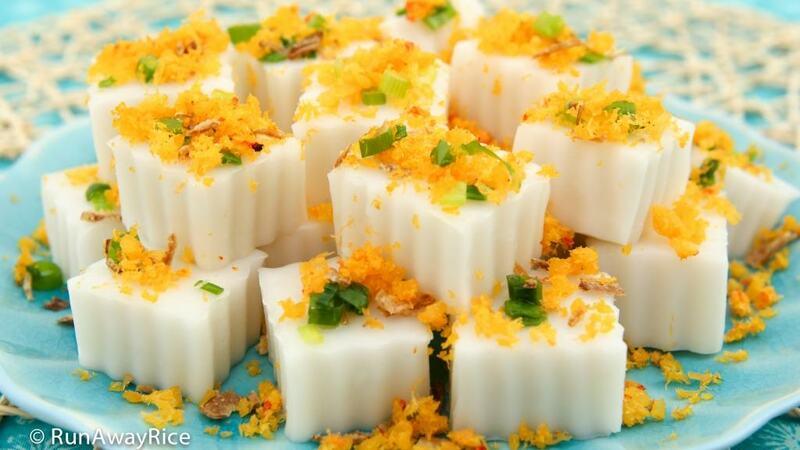 This recipe for Steamed Coconut Rice Cake with Toasted Shrimp Flakes (Banh Duc Tom Chay) is the ultimate savory snack food. The simple rice flour batter is infused with creamy coconut milk and steamed into a delicious light cake. 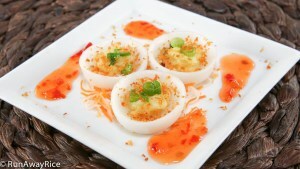 Sprinkled with abundant savory toppings: scallion oil, fried onions and toasted shrimp flakes and served with tart pickles and a zesty fish sauce dipping sauce, these savory coconut rice cakes are full of amazing flavors and wonderful textures. The cakes are served in bite-sized pieces, so eat a little or a lot. They make yummy snacks, small bites or quick meals. Make some today to enjoy! If you’re wondering why the extra step to cook the batter first in the saucepan instead of just steaming it right away, it’s because this batter separates when left resting, even for just a minute. So, we cook it first to prevent the flour/starch from separating. Heat the batter slowly using Low heat while whisking together. First you’ll see the batter sticking to the tip of the whisk. Next, you’ll feel a little resistance on the bottom of the pan when stirring. As soon as the batter on the bottom of the pan starts to thicken, quickly remove from the heat. Avoid heating the batter using a lot of heat. The batter will thicken really quickly into a thick paste. The ideal consistency is similar to a thick cake batter. If it’s a bit looser, that’s fine too. If you overheat the batter and it gets really thick, like a mashed potatoes, don’t worry. The cake will be fine. Just spread the thick batter into the pan, smooth it out as much as possible and steam as directed. This batter is really forgiving and the cake can be smooth or have a rougher texture. Refrigerate any leftovers and enjoy within the week. To reheat, steam the cake lightly or microwave on Low power for 30-45 seconds. Sealed well, the cake can be frozen for 2 months. To reheat after freezing, thaw to refrigerator temperature and reheat as per above. If frozen, cover well and microwave on High power for 60-90 seconds. Add vegetable oil into an 8-inch square dish. Brush the oil, coating the bottom and sides of the dish evenly. In a large bowl, add the rice flour, tapioca starch, salt, water and coconut milk. Whisk together until the mixture is smooth and free of lumps. Strain the mixture into a medium saucepan. Heat the mixture over Medium Low heat while whisking together. In approximately 5-6 minutes, the batter should start clinging to the tip of the whisk. When the batter on the bottom of the pan starts to thicken, quickly remove from the heat. (The top of the batter will still be mostly liquid.) Continue stirring together until all the liquid is absorbed. Whisk the batter quickly for 30 seconds to remove any lumps. Transfer the batter into the oiled dish. Use the spatula to spread the batter evenly into the dish. Remove any air bubbles by running a skewer through the batter. Optionally, tap the dish on the counter a few times to remove any air bubbles. Smooth out the top. Transfer the dish into a steamer tray. Fill a steamer basin two-thirds full with water and bring to a rapid boil over High heat. Set the steamer tray over the basin and cover with a lid wrapped in a kitchen towel. Steam the cake over High heat for 20 minutes. Remove the cake from the steamer and let cool for at least 30 minutes. Run a spatula around the cake to loosen it from the dish. Invert the cake onto a flat cutting surface. Brush vegetable oil onto a wavy knife. Cut the cake into strips and then cut into bite-sized pieces. 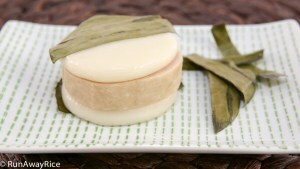 To serve, place a few pieces of steamed coconut rice cake on a small plate. 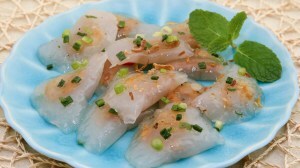 Top the rice cake with scallion oil, fried onions and a generous amount of toasted shrimp flakes. 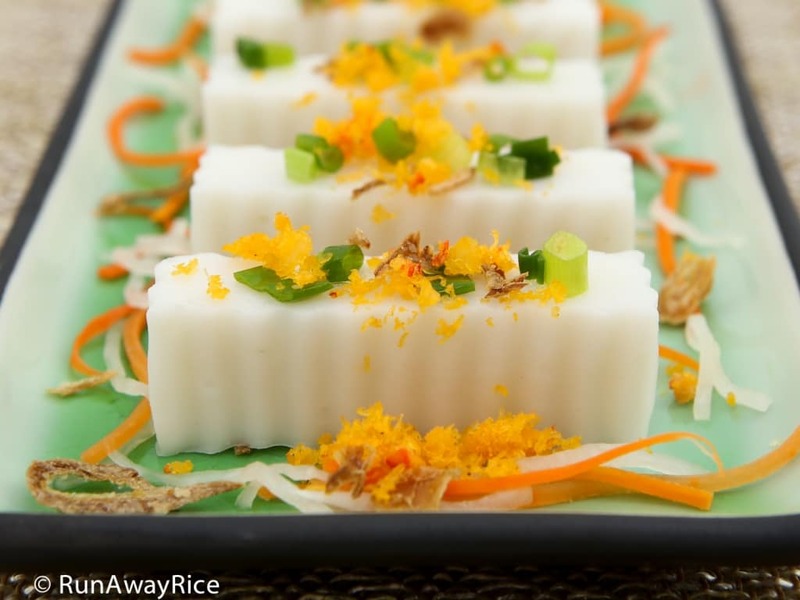 Serve the Steamed Coconut Rice Cake and Toasted Shrimp Flakes with a side of carrot and radish pickles and zesty fish sauce dipping sauce. Add vegetable oil into an 8 inch square dish. Brush the oil, coating the bottom and sides of the dish evenly. Transfer the batter into the oiled dish. Use a spatula to spread the batter evenly into the dish. Remove any air bubbles by running a skewer through the batter. Optionally, tap the dish on the counter a few times to remove any air bubbles. Smooth out the top. Transfer the dish into a steamer tray. 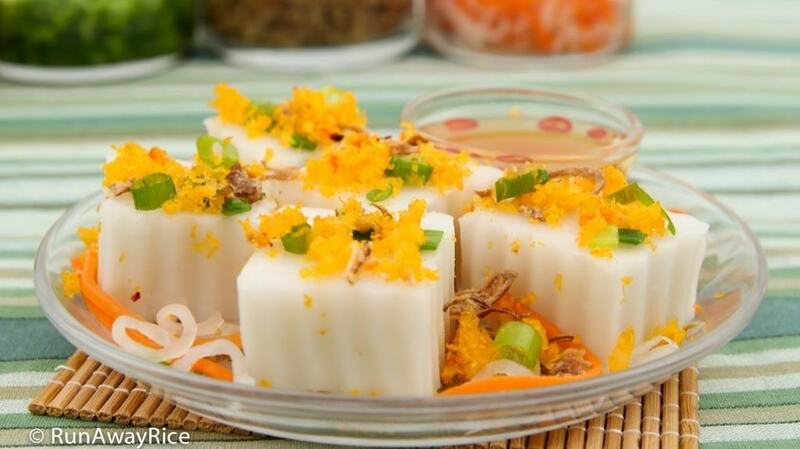 To serve, place a few pieces of steamed coconut rice cake on a small plate. Top the cake with scallion oil, fried onions and a generous amount of toasted shrimp flakes. 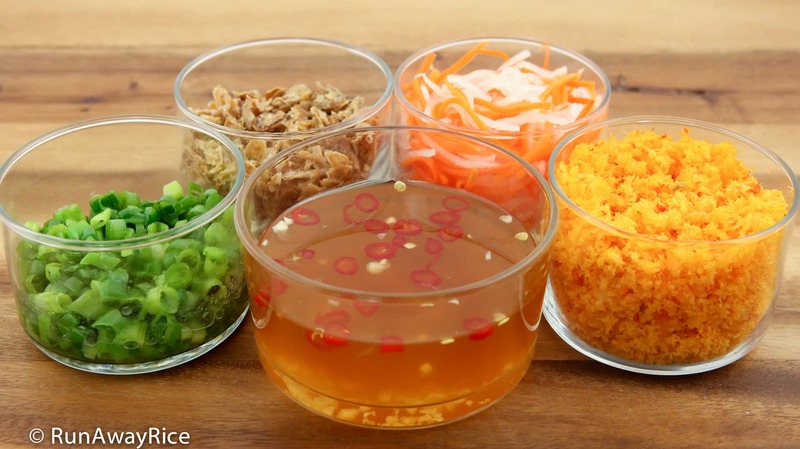 Serve the Steamed Coconut Rice Cake and Toasted Shrimp Flakes with a side of carrot and radish pickles and zesty fish sauce dipping sauce. If you're wondering why the extra step to cook the batter first in the saucepan instead of just steaming it right away, it's because this batter separates when left resting, even for just a minute. So, we cook it first to prevent the flour/starch from separating. Heat the batter slowly using Low heat while whisking together. First you'll see the batter sticking to the tip of the whisk. Next, you'll feel a little resistance on the bottom of the pan when stirring. As soon as the batter on the bottom of the pan starts to thicken, quickly remove from the heat. Avoid heating the batter using a lot of heat. The batter will thicken really quickly into a thick paste. The ideal consistency is similar to a thick cake batter. If it's a bit looser, that's fine too. If you overheat the batter and it gets really thick, like a mashed potatoes, don't worry. The cake will be fine. Just spread the thick batter into the pan, smooth it out as much as possible and steam as directed. This batter is really forgiving and the cake can be smooth or have a rougher texture. Refrigerate any leftovers and enjoy within the week. To reheat, steam the cake lightly or microwave on Low power for 30 seconds. Sealed well, the cake can be frozen for 2 months. I love to follow your recipes. Thank you for sharing! Yay!!! Thanks for the recipe! Now I have to make the shrimp flakes!! !